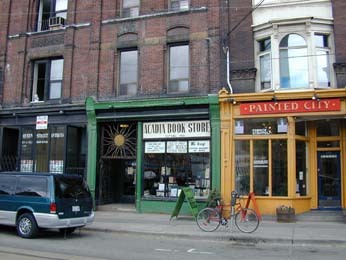 Someone was stabbed outside the bookstore window when I was working there years ago at Queen and Sherborne. This was the first radio doc I ever made, and WOOOOH, was it a ride. Funny to listen to it now. CBC Radio OUT FRONT (which I went on to work for as Associate Producer, a couple of years later) wanted the teller of the story to be very present in the piece. I like the other voices SO much, I wish mine wasn’t so ‘present’. What amazing strangers I met wandering Queen Street while working at the bookstore. My greatest mentor to date, Steve Wadhmans, radio doc producer extraordinaire, held my hand for the editing process and taught me all about sound pictures and scenes. Greatest sound storyteller ever… from CBC, now retired and singing tenor in Victoria, BC. I enjoyed listening to your documentary. Miss you Karin! How is Montreal!?! Hello Dawn, I just listened. You are so talented! I felt like I was walking along the street with you, envisioning all the stories you told. Nancy!! So nice of you to comment. I miss radio. Hope to make more docs down the road. I must get this site up to date .